Since I was a little girl, I’ve had this knack for stretching out my birthday for as long as I can, turning one day into a week-long celebration. 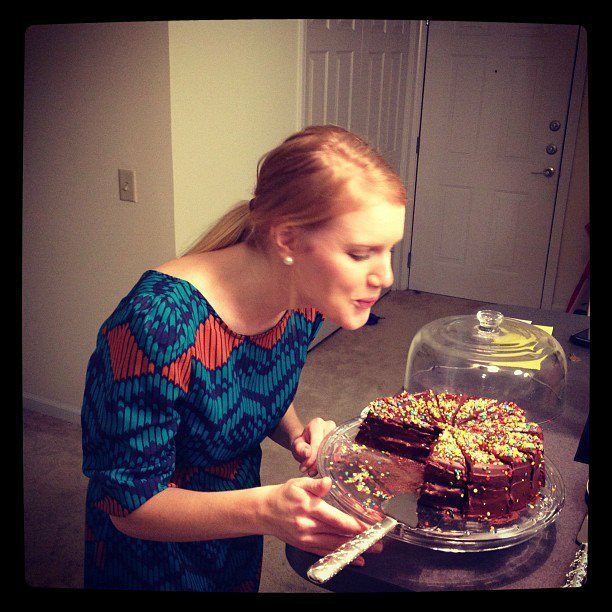 Though the circumstances this year were a little different, my 23rd birthday was a weekend-long party. 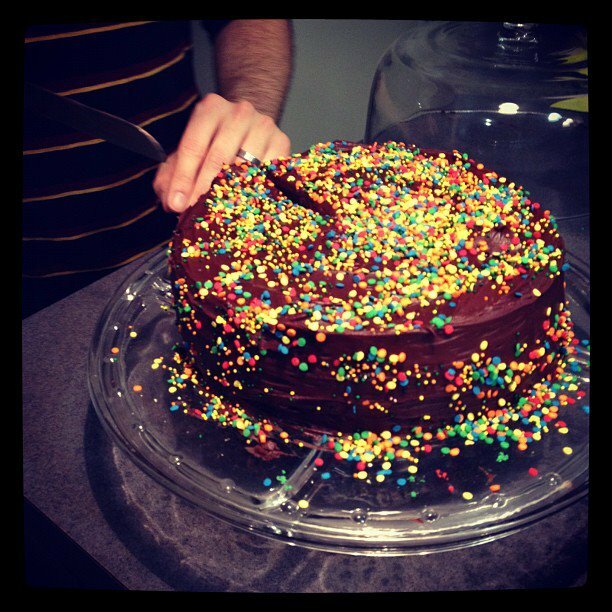 About a week ago over dinner, Drew said that he wanted to make me a chocolate cake. Not just any cake, mind you, but a cake from scratch. Knowing that Drew has never made a cake that didn’t come from a box, I was absolutely thrilled, if not a little nervous for him. He’s seen me bake countless muffins and cookies, and has seen many of the flour-caked kitchen messes that inevitably occur. Still, he was set on making me a chocolate layer cake so I picked out a recipe and sent it his way. Saturday afternoon Drew logged several hours in the kitchen whipping up my birthday cake. It was also the perfect opportunity to use a few wedding gifts that we’d received but had yet to use–our cake platter and serving utensils, and dessert plates. That night, a big group of our friends met at Noodle, the restaurant of choice for my birthday dinner. Drew and I are no strangers to Noodle; we’ve been there five times and love the food, as well as the fact that it’s within walking distance from our apartment. It was fun getting to recommend our favorite dishes to our friends who hadn’t yet eaten there. After ordering drinks and mingling, we settled into our food, which comes in very generous portion sizes. I ordered the peanut Thai noodle bowl with chicken while Drew ordered his tried and true chicken fried rice. Everyone’s dishes smelled amazing and it was pretty clear that everyone really enjoyed their meals. Drew slicing into his masterpiece of a cake. It was so good! As we awoke to the alarm this morning, Drew once again serenaded me with a sleep-eyed version of Happy Birthday. After getting out of the shower, I found several new clothes laid out on the bed, my birthday present from Drew. He told me that when I went out for a girls’ night viewing party of The Bachelor last Monday that he’d high-tailed it to the mall for a Gap shopping trip. It was the first time he’d picked out clothes for me and said he actually used my Pinterest Style board to help him choose the shirts and sweater. What a resourceful husband I have 😉 After a great church service, where I wore my new sweater, we headed back home for brunch. Drew’s cooking prowess was not finished for the weekend: he’d make his Dad’s recipe for homemade bread earlier in the week, and was going to use it in Nutella-stuffed French toast. If you know me at all, you know that I have an obsession with Nutella; I could eat the stuff straight from the jar with a spoon. 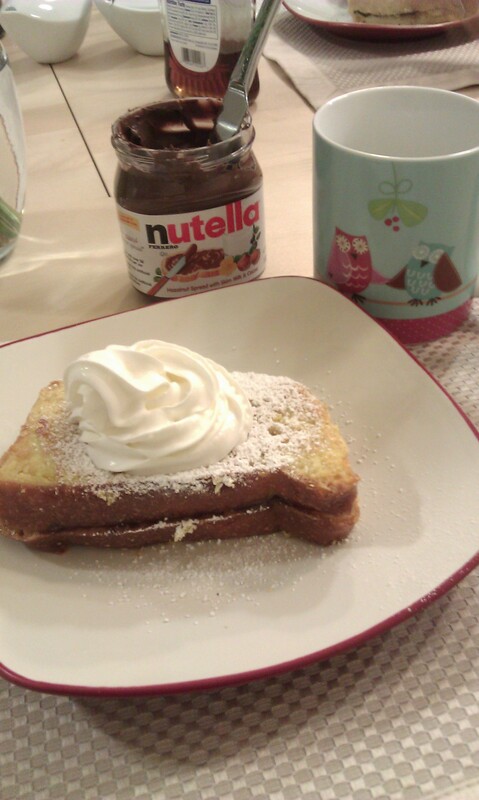 Nutella stuffed French toast = Heaven on a plate. Our homemade margherita pizza. Yum! After the best birthday brunch ever, Mom and Dad called to wish me Happy Birthday and we caught up for a while. 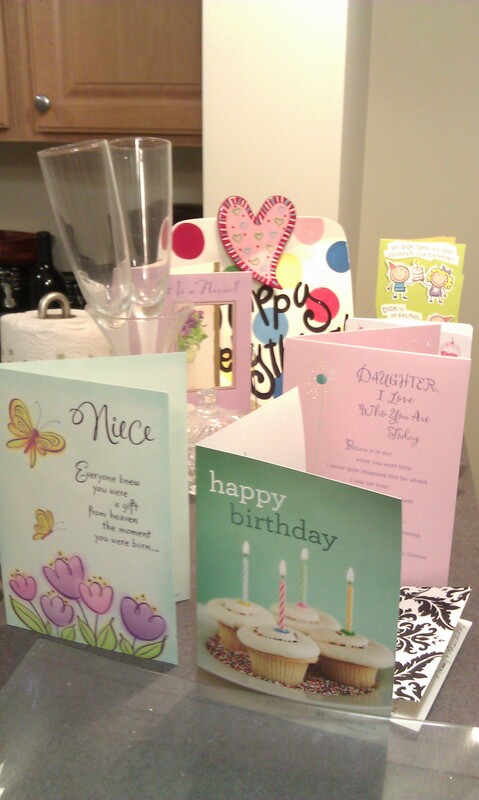 I finished opening my birthday cards and gifts. After our late night before, an afternoon nap was in order and we dozed for several hours. 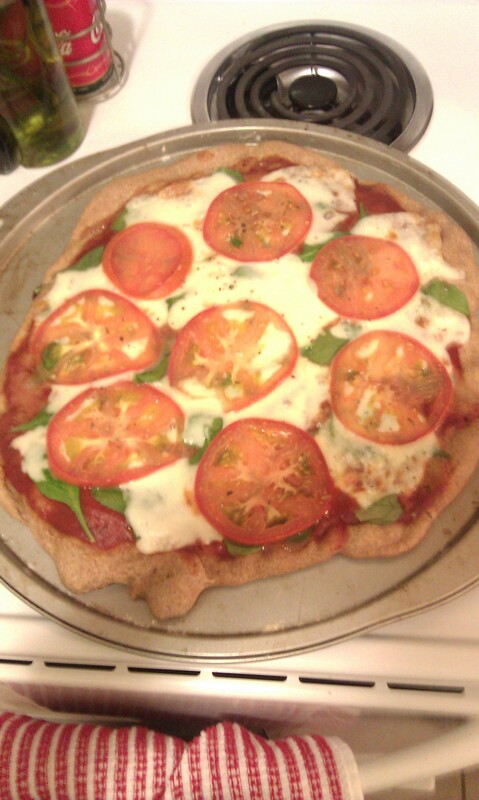 We then made a quick trip to Trader Joe’s and Publix, picking out ingredients to make two homemade pizzas. We made margherita and BBQ chicken pizzas, both of which were absolutely delicious. Ever since we started going to pizza clubs with several of Drew’s friends from work, we’ve really taken a liking to crafting our own pizzas. I think a dessert fruit pizza is next on our list of must-tries. Now that the night is winding down, we’re watching the Giants/49’ers game, completely stuffed from a great dinner. It’s been an absolutely wonderful birthday weekend, and I’m so blessed to have such great friends and family. Thank you to all our friends who celebrated with us on Saturday night, and for the thoughtful gifts friends and family gave me. I don’t feel any older yet, but I’m sure it will hit me soon the next time I have to write my age on a form or tell someone I’m 23. Last year was an amazing year filled with so many firsts, but I think this year is going to be one for the books as well. It’ll be my first full year of marriage to a man I fall in love with over and over again every day (the Nutella French toast certainly contributed to that! ), and as a college graduate with a real world job in an awesome city. 23 is going to be sweet and I’m very excited for what’s in store! Oh, that cake is absolutely purrfect! I would love a slice! Sounds like you had a wonderful birthday! Our gift to you should arrive today. So, another day of stretching it out for ya!! Wanted to get it in the mail sooner but last week was one of those weeks! Drew did a great job on the cake and it looked good! Now, do I dare tell you my condition on my 23rd birthday? 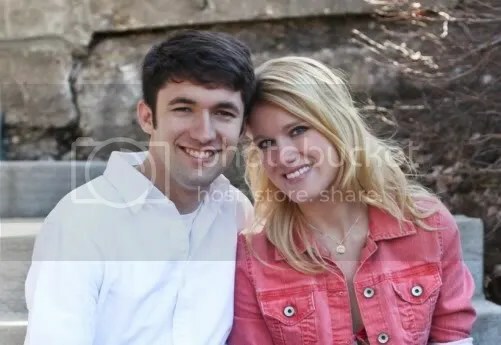 …….I was due with Drew at any moment…he was actually due on my bday but being the sweet guy he is, he waited another ten days to enter the world so we would both have our own birthdays.